Recruiters from Tufts University's Cummings School of Veterinary Medicine recently fanned out to Massachusetts schools, looking for future vets. They hunted for top students and those with an aptitude for working with animals. They paid particular attention to boys. But when 25 high school students arrived this month for a two-week stay at Tufts's Adventures in Veterinary Medicine camp, all but four were girls. "People do say it's a girly field," said A.J. Guerra, 15, of Stafford, Conn., who said he wants to be a small animal vet. "My dad is a nurse, and people say that's girly, but so what? I love animals." The program's radical gender imbalance reflects a broad trend in the veterinary profession. While just 5 percent of veterinary students were women in the 1960s, today 79 percent of the seats at the nation's 28 veterinary schools are occupied by females. The ratio is more dramatic at some schools, such as Tufts, where last year 89 percent of its first-year class were women; at Michigan State and University of California-Davis, 88 percent and 81 percent, respectively, of the incoming classes are women. This year, for the first time, the number of practicing women veterinarians nationwide is equal to the number of practicing males. There is little research to provide an explanation of the trend, but theories abound. The practice of veterinary medicine is considered more flexible and less time-intensive than some other professional fields, making it attractive to women who hope to have families. It pays, typically, less than fields such as human medicine, law, and dentistry -- a factor that some say makes it unattractive to men who generally expect to be a home's sole breadwinner. Another theory is that women have been drawn to the field, and men have left it as it has transformed from one focused on large farm animals, valued for their practical use, to one that predominantly cares for pets. Many veterinarians now are expected to care not only for animals but for feelings of pets' owners. "It's hard for guys to be so openly compassionate to fuzzy animals," said K.C. Horigan, 25, of Scituate, a woman in her second year at Tufts veterinary school. Aziz Chughtai, 28, a third-year student at Tufts, said, "There is the expectation in our society of females being more nurturing, and so they may be more open to a profession that has that as a core requirement." But, he added, "I do think that men, as a species, are just as capable of it." The predominance of women entering veterinary medicine is a remarkable reversal from just four decades ago when women struggled to gain admission to veterinary schools. It is also a departure from some other science fields -- like engineering, computer science, and human medicine -- where men continue to outnumber women in most degree programs. The change is so dramatic that some veterinary medicine schools worry that the pendulum has swung too far and are taking steps to move it back. 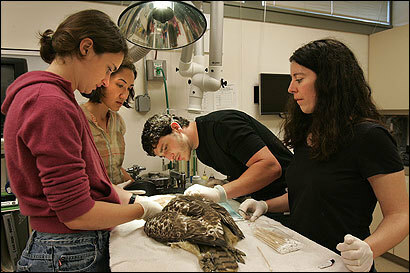 At the University of Georgia College of Veterinary Medicine, administrators encourage their alumni to take boys into their practices to serve as interns, and at the newly founded College of Veterinary Medicine at Western University of Health Sciences, in Pomona, Calif., the admissions process takes gender into consideration, along with other factors. "Every school in the country kills themselves trying to get men," said Shirley Johnston, who became the nation's first female veterinary school dean in 2003 at Western University. Today there are three female deans of veterinary schools in the United States. Some educators worry that having so many women in the field will eventually divert talented men who might view veterinary medicine as exclusively "women's work." There are also concerns that the small numbers of men will leave holes in the profession, since women tend to steer clear of large animal medicine, despite the fact that technology enables women to handle large animals as well as men can. Others say that after years of underrepresentation of women in veterinary medicine, their prominence in the field has no downside. Some say it could even serve as a reminder of women's abilities at a time when controversies over women's aptitudes in science are still sometimes questioned. In 2005, then-Harvard President Lawrence Summers caused a heated debate after publicly speculating that innate differences between men and women might be one of the reasons women lag in science and math careers. "The students who are attending are getting brighter every year," said Corinne Sweeney, associate dean at the University of Pennsylvania School of Veterinary Medicine. "Having a majority gender is fine, so long as all feel welcome." Indeed, for some in the field, women's over-representation is a point of pride. "It's great to have a field that is women dominated," said Stefanie Kreiger, a Tufts graduate who co-owns a practice in Connecticut with another female veterinarian. "It's not that I want to squeeze men out, but having so many women does feel important." Women began entering veterinary medicine in significant numbers in the 1970s, after the enactment of Title IX and other legislation mandating equal access. The balance began to tip in the 1980s, and the proportion of female applications and enrollment has increased since then, while male applications and enrollment have dropped off. Educators and practitioners say the imbalance could correct itself with time. The field is changing, with an increasing focus on the prevention of animal borne diseases and biodefense -- hard-edged science that some say men will find appealing. But in the meantime, there are veterinarians-to-be out there like Colleen Ottomano, 17, of Hopkinton, who attended Tufts's preveterinary program this summer. "I think girls make great veterinarians. We are more patient than boys," she said. "And you need to be because you can't talk to an animal."